Visual impairment intracranial pressure syndrome (VIIP) is named for the leading theory to explain it. On Earth, gravity pulls bodily fluids down toward the feet. That doesn’t happen in space, and it is thought that extra fluid in the skull increases pressure on the brain and the back of the eye. At first, NASA thought that Phillips’s was an isolated case. But then researchers found evidence of VIIP in other astronauts. VIIP has now been recognized as a widespread problem, and there has been a struggle to understand its cause — and to study it. The theory that fluid builds up in the skull during spaceflight hasn’t actually been tested. The only proven methods of measuring intracranial pressure are invasive: the spinal tap or drilling a hole into the skull. Here on Earth, the most similar condition is idiopathic intracranial hypertension (IIH). Patients with this condition also have increased pressure in their heads, and they experience visual changes such as those of the astronauts. 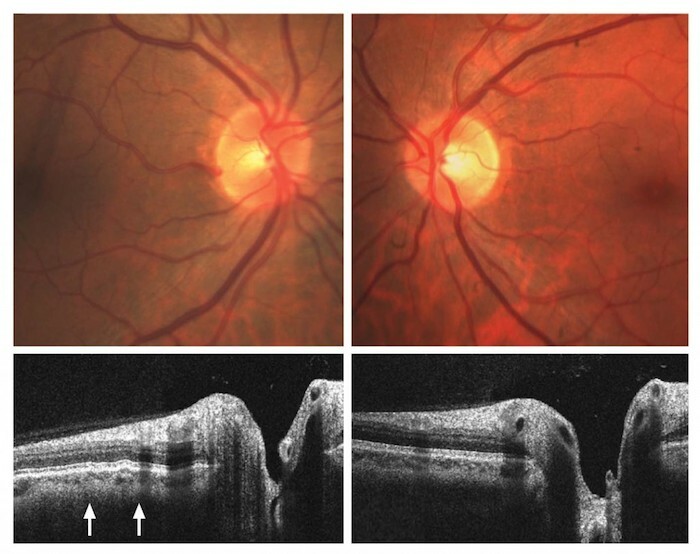 Another condition, papilledema, involves optic nerve swelling. But they are not perfect models for the astronauts’ disorder. “Idiopathic” means that no one knows what causes it. It comes with a deluge of other symptoms, including nausea, dizziness and severe headaches, that astronauts with VIIP do not experience. And the medication for papilledema, optic-nerve swelling, does not work on astronauts with VIIP. Karina Marshall-Goebel at the Institute of Aerospace Medicine in Germany is trying to study VIIP using a head-down tilt test, in which participants’ bodies are tilted slightly to simulate the fluid shift in space. But Marshall-Goebel said that the test is not ideal. It is still affected by gravity, and researchers cannot keep people tilted for as long as astronauts live in space. Other researchers are searching for less-invasive ways to assess brain health on Earth and, potentially, in space. Eric Bershad, an intensive-care neurologist at the Baylor College of Medicine, is working on a way to measure brain pressure using an ultrasound test on an eye artery. Other devices being developed use sound waves and radio waves to attempt to measure the brain at its different access points: the skull, ears and eyes. There is one that estimates brain pressure by pushing on an anesthetized eye until a vein flattens, sort of like stepping on a gardening hose. “So far, none of the non-invasive technologies are accurate enough to replace the invasive measurement, but I think within the next few years there is a good chance there will be,” Bershad said. Ross Ethier, a biomedical engineer at Georgia Tech, is using models to simulate what happens in the body when intracranial pressure goes up. He is looking at a potential mechanical solution: a device that could draw fluid back down to the legs in space. It would likely be clunky and uncomfortable, so he would need to know how long a person would have to wear it — two hours a day? Three? Michael Barratt, the former head of NASA’s human research program and a specialist in space medicine, argues for a more radical approach. Barratt is also an astronaut. While he was on a six-month mission on the space station in 2009, he noticed his vision deteriorating. He and a crewmate, Bob Thirsk, were both medically trained, and they decided to do something about it. Barratt thinks solving the puzzle of VIIP is going to require testing intracranial pressure in space, even if that means an invasive procedure. One option is an intracranial probe that would be surgically implanted months before flight and allow pressure to be measured at different points during spaceflight. It could also answer questions about other potential factors, including heightened carbon dioxide levels and the effect of in-flight exercise. A study published in April 2015 tested intracranial pressure during a parabolic flight, which achieves zero gravity for around 25 seconds. A team took advantage of scalp implants that four men had for other medical reasons, and measured pressure at all stages of flight. The results showed an initial spike in pressure, but during zero gravity, intracranial pressure went down. It was a confusing result, showing the opposite of what was expected. Barratt draws parallels to a similar conundrum from the 1990s, when it was unclear how the pressure in the heart was affected by space flight. NASA performed an invasive test, inserting catheters up into the hearts of astronauts. The test showed conclusively that blood pressure in veins close to the heart did not go up. In fact, it went down. The top risk remains radiation exposure. According to a radiation detector that flew aboard the Mars Curiosity Rover, a human would be exposed to a minimum of .66 sieverts to get to Mars and back — the equivalent of getting a whole body CT scan every five to six days, which would heighten the risk for cancer and other diseases. Before a human trip to Mars — a journey of six-to-nine months that NASA says it wants to achieve by the 2030s — researchers agree that VIIP must be understood much better. But he and other astronauts say that they would not trade their time in space to get back the lost visual acuity. Astronaut Michael Lopez-Alegria holds the U.S. record for the most time spent doing spacewalks. 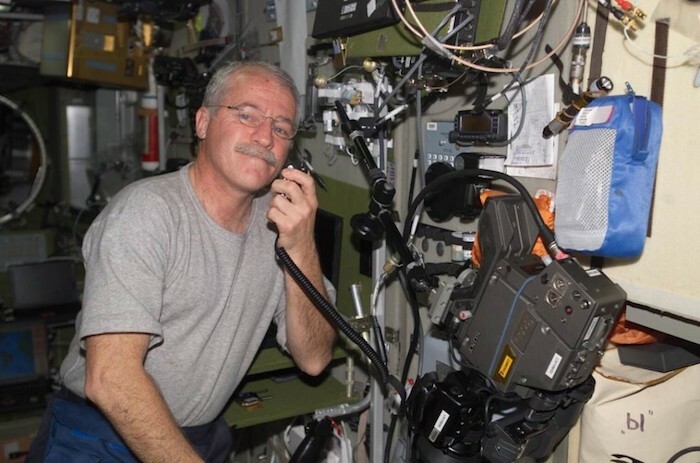 His longest trip was 215 days, and he called being in microgravity “magical.” He wears contacts with a +2.5 correction. Phillips now considers himself just another 65-year-old with glasses. But before his trip in 2005, he was always used to being the guy with the best vision, the first one in the car to read a street sign. “So that era was over,” he said.